Baby's the size of an eggplant! He's starting to develop more fat, so his wrinkly skin will start to get smoother. Also, his lungs are mature enough that he'd survive if was born now! Best Moment This Week: (See below). People often ask me if Karis understands what's happening and that she's going to have a baby brother. The simple answer is, no. For starters Karis still only has a few words in her vocabulary, so she's not communicating with words what's happening. Furthermore, it's a HUGE concept to grasp. Even at my age, and having had a baby before, it still hurts my brain to truly conceptualize that there is an entire human in my belly. 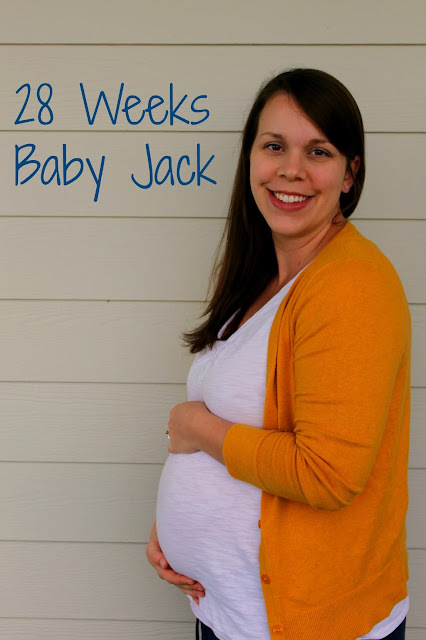 On top of that, we talk about Baby Jack quite a bit, but we aren't constantly telling her that he lives in Mommy's belly...yes, we mention it at times, but weren't not hung up on that part. However, this past week, she has been so sweet and rubbing my belly occasionally. Sometimes she will even lift my shirt and look at my belly for a few minutes then give it a few loving pats. It's so sweet. I know that she knows something's happening and that's enough for now. I had my glucose test yesterday, here's to hoping I passed. I did fine and passed with Karis, but I still get nervous for that test.